More digital content is now on offer via our New England's Hidden Histories program, in collaboration with the Phillips Library at the Peabody Essex Museum. These new collections include two personal diaries from the early 1700s, one belonging to a celebrated Salem minister, the other to an ordinary citizen from Lynn, Mass. Despite the authors' differences, the two accounts share striking similarities, such as a preoccupation with local weather, farming and husbandry, travel, and visits with family and friends. As if these personal records weren't fascinating enough, the third collection is a legal testimony by John Stockman of Salisbury, Mass. admitting to a physical assault on the King's Highway. Rev. Joseph Green was a celebrated minister of the First Church of Salem. Ordained in 1698, he inherited a divided and traumatized congregation after the Salem Witchcraft Trials of 1692. He replaced the controversial Rev. Samuel Parris, reuniting the church and facilitating reconciliation between perpetrators and victims of the witchcraft hysteria. His diary of 1700-1715 deals mainly with day-to-day concerns such as religious study, errands and meetings, though it also touches on more monumental events such as Ann Putnam’s public admission that she had falsely accused others of witchcraft. 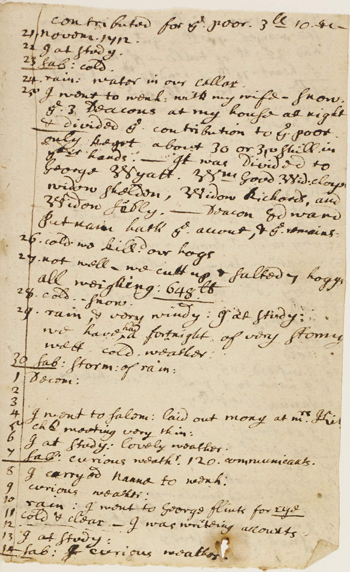 The diary of this Lynn, Mass., man details a 43-year period of daily life, including agricultural tasks, notations on attendance at religious meetings, visits from his friends, and observations about the weather. The diary is contained within two bound volumes, the first comprising the years 1726-1750, and the second 1750-1769. In this document John Stockman admits wrongdoing and apologizes to a Mr. Caleb Moody, Jr., whom he assaulted "in the Night under the temptation of Satan". The Moodys and Stockmans were both prominent families in the Newbury/Salisbury area during the early 18th century. Have a look through these collections to get a sense of what daily life in New England was like during the early 1700s, through the words of those who lived it. These latest additions to our New England's Hidden Histories program come from our project partners, the Phillips Library at the Peabody Essex Museum. Both collections comprise the personal papers of two prominent Salem ministers, Rev. George Curwen and Rev. Samuel Fisk. The two men served consecutively as pastors in the First Congregational Church in Salem during the early 1700s, not long after church members had been rocked by the witchcraft hysteria of 1692. Rev. Fisk infamously caused a split in the congregation with his alleged mishandling of records and his doctrinal peculiarities. He and his supporters went on to form the Third Church in Salem, which would later become known as the Salem Tabernacle. The collection includes an array of biographical material such as professional and personal correspondence, church administration, and posthumous legal records. 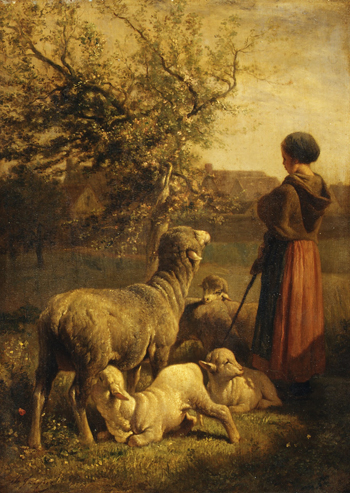 A number of sermons delivered by Rev. Curwen during his time at Harvard are also included. These were preached under the auspices of various local ministers, including a "Rev. Mather" who was either the famed Rev. Cotton Mather or his son, Rev. Increase Mather. These manuscripts are part of the Joseph Bowditch Papers, a larger collection at the Phillips Library. They contain a sizeable amount of correspondence concerning Rev. Fisk, both personal and legal. Most of the records relate to the split within the First Church's congregation during (and due to) Rev. Fisk's controversial ministry. These include heated letters back and forth, Rev. Fisk's official dismissal at the hands of an ecclesiastical council, and a legal ruling on the case by the Massachusetts House of Representatives. Anyone with an interest in the history of the Congregational Church in Salem will find these collections a useful primary source, and — in Rev. Fisk's case — also quite a juicy read! The people of Gloucester—the English one, not its namesake in Massachusetts—are remembering their native son, George Whitefield, in a very practical way. The St. Mary de Crypt Church, where he was baptized educated, and preached his first sermon, has undertaken an ambitious restoration project. The Discover DeCrypt project is bringing the church into the twenty-first century as a place of worship as well as community center and part of a Whitefield heritage trail. Last fall we met Mark Jones and Richard Atkins, who came to the Library from Gloucester. They were, like George before them, traveling up and down the East Coast, tracing Whitefield’s career for a BBC radio program. What was the connection with the Congregational Library? Rev. 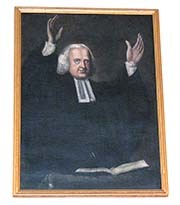 Whitefield was not, of course, a Congregationalist, but we possess a rare portrait that hangs prominently in our reading room. And I was glad to be interviewed for their program, which aired last winter. Both of the de Crypt buildings are very old, and as the renovations have progressed, more of their history is unfolding. Below the schoolroom floor, archeologists on site discovered remains from the fifteenth-century (maybe not old by English Gloucester standards but pretty impressive here). The congregation also discovered a collection of Whitefield sermons from 1742, given to the church in 1899. Projects like this one are expensive, and we are passing the word along about the renovation in hopes that some of our readers might want to contribute. US donors can give directly through the website (www.discoverdecrypt.org.uk). It’s gratifying to see George Whitefield’s home town remembering one of the most famous people of the eighteenth century in such an ambitious and thoughtful way. Our reading room will be closed to the public on Friday, May 4th from noon to the end of business. The staff will be doing some reorganizing of our stacks, and don't wish to disrupt any researchers with the noise. All of our online resources will be available as usual. If you have questions that require staff assistance, please send an email or leave a voicemail, and we'll get back to you as soon as we can. Historians of religion in early America ought to be shouting “Huzzah!” for the Congregational Library & Archives these days. Since 2011, Jeff Cooper and a team of scholars at this important research archive on Boston’s Beacon Hill have been gathering at-risk Congregational church records from basements, bank vaults, and private homes. 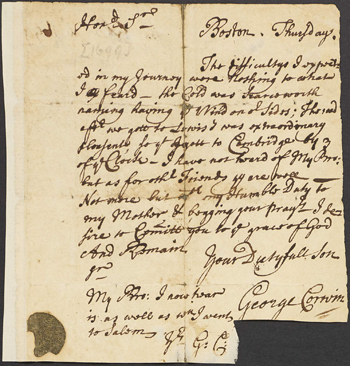 The goal of the Library’s New England’s Hidden Histories project is stunningly ambitious: to preserve, digitize, and transcribe tens of thousands of pages of seventeenth- and eighteenth-century church records. I’ve been fortunate to serve on the steering committee for the program, which is led by Cooper and the Congregational Library’s executive director, Peggy Bendroth. Many of the key manuscript collections cited in Darkness Falls on the Land of Light are now available online through the NEHH portal, while many others are coming soon. More than 500 church admission relations from Haverhill, Middleborough, and Essex, Massachusetts—all in full, glorious color! And a wide range of sermons, theological notebooks, and personal papers by eighteenth-century Congregational clergymen, including luminaries Cotton Mather, Jonathan Edwards, and Samuel Hopkins. Cooper and Bendroth have forged partnerships with New England’s leading history institutions, including the American Antiquarian Society and Peabody Essex Museum. And they have digitized An Inventory of the Records of the Particular (Congregational) Churches of Massachusetts Gathered 1620–1805, the indispensable guide compiled by Bendroth’s predecessor, Harold Field Worthley. For teachers eager to show their students what seventeenth- and eighteenth-century history is made of; for undergraduate and graduate students seeking primary texts for papers; for genealogists searching for baptismal records of long-lost ancestors; for scholars engaged in major book projects—NEHH is now the go-to hub for online research on the history of New England puritanism and the Congregational tradition. As with all digital history initiatives, NEHH is a work in progress. They’re always looking for volunteers to support their crowd-sourced transcription projects. It’s a great opportunity to involve students in the production of new historical knowledge. For more information, contact Jeff Cooper or Helen Gelinas, director of transcription. Thanks to a second $300,000 grant from the National Endowment for the Humanities, Bendroth, Cooper and their colleagues at the Congregational Library will be churning out high quality digital images and transcriptions of rare Congregational manuscript church records for years to come. Congratulations, CLA! Huzzah! To read more about the NEH grant, check out this article from the Christian Science Monitor. This blog was originally featured in Douglas Winiarski's blog The People Called New Lights. On Tuesday, April 17, James “Jim” Matarazzo, Dean and Professor Emeritus, Simmons College School of Library and Information Science, passed away in Boston. To those of us in the Library and Archives’ field, Jim was a legend. For almost 50 years, he guided students from the classroom to successful careers, always being available and never forgetting anyone and their life. His gentle and humble nature belied a brilliant and cagey navigator of the working world…and he always paved the way into that world for his students. The mention of Jim’s name always elicits a smile to the many whose lives he touched. The image of Jim’s pleasant smiling visage with his beloved pipe will forever be etched in my heart. His ability to remain calm and understanding while subtly being relentless in your behalf were the building blocks of his success. He was the Will Rogers of the Library and Archives world…never meeting a person he didn’t like and he took that easy-going nature a step further and always connected good people with each other. Here at the Congregational Library and Archives, we are forever indebted to Jim for his tireless work on our behalf to help move many projects and endeavors forward with wisdom and funding. Many a student has walked through our doors with confidence and abilities that Jim helped craft. We are among the many who will miss Jim dearly, but his confidence in us (and everyone) is contagious. A day won’t pass without someone whispering thank you for a successful path he started. “New England’s Hidden Histories” will collect and publish an additional 18,000 pages of records from the nation’s founding era from the archives of churches in the American Northeast; 7,000 of these pages will be transcribed. The documents are of immeasurable value to anyone "exploring political culture, social history, linguistics, epidemiology and climatology...as well as to genealogists and members of the public interested in a range of subjects," The National Endowment for the Humanities said in its announcement. Early New Englanders recorded the most intimate details of their lives and communities in their manuscript church records. Spirited church debates, disciplinary hearings, personal narratives, and vital statistics listing marriages, births, and deaths, can all be found in often lost or hidden church records. “New England’s Hidden Histories” looks to reveal the texture of early New England society, sharing the stories of ordinary people in extraordinary detail. The project has already produced tens of thousands of digital images of these documents in its ongoing effort to freely share this historical resource with scholars, teachers, genealogists, and all interested members of the public on the website of the Congregational Library & Archives.